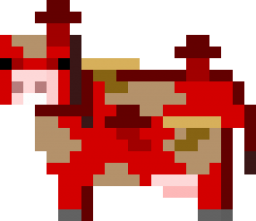 Mooshrooms are special, rarer types of cows in Mine Blocks. Mooshrooms are animals that naturally spawn only in the Mushroom Biome, although they can be spawned by the player by a spawn egg. Like cows, when killed, they drop 1-3 leather. They also drop 1-3 raw beef (1-3 steak if it takes death by fire), plus some xp. They can also be used for collecting milk with buckets, and soup with bowls. 14 Slay a Cow. Kill a cow (also works with the mooshroom). The name "Mooshroom" is a portmanteau for "moo" (which itself is an onomatopoeia of a cow's sound) and "mushroom".